Rimma Sushanskaya is a world-renowned violinst. 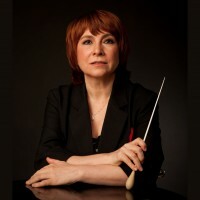 Following a glowing career of performing and recording Rimma has more recently concentrated on conducting. Each year she also runs the popular Virtuoso Violin Festival in Stratford. The Virtuoso Violin Festival celebrates the string music of Bach, Paganini and other composers. Masterclasses, individual and orchestral tuition, inspiring in-depth understanding of the music and its performance all led by distinguished international musicians. Guy Woolfenden, who has died at the age of 78, was head of musical production at the Royal Shakespeare Company for 35 years, composing over 150 musical scores for the company. Notably, he wrote scores for all 37 of the Shakespeare plays, some of them several times over.